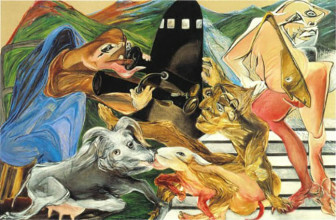 As part of the Stedelijk Turns series, the Stedelijk Museum has put together an exhibition with Jacqueline de Jong in which the artist moves through the collection of the museum like a “pinball wizard.” Relying on her own virtuosity and fascinations, and in combination with key works from her oeuvre, De Jong “plays” art history. She does this by means of unconventional combinations and a selection of well-known masterpieces and never-before-seen prints, drawings, artist’s books, design objects, and archival material. 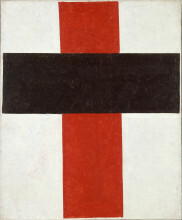 The exhibition not only offers a unique perspective on the Stedelijk collection but also gives the public the opportunity to become acquainted with De Jong’s remarkable biography and oeuvre in the context of the network within which it emerged. Jacqueline de Jong (Enschede, 1939) is an experimental visual artist and designer who, since the beginning of the 1960s, has built up a versatile body of work. 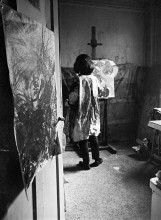 Of particular interest is the way in which she operated among the leading avant-garde networks, both within and outside of Europe, from her first encounters with artists such as Germaine Richier and Maria Elena Vieira da Silva during her youth, to her cosmopolitan parents and their prominent collection of avant-garde art, to her participation in Gruppe SPUR and the Situationist International (S.I.). The studio of Hans and Alice de Jong (architect Jelle Abma), Hengelo. Archive Jacqueline de Jong. De Jong lived in Paris from late 1960 until 1971. There she was active in a network of artists and designers and produced a variety of work, including posters during the Paris student uprising of May ’68. During this period she also initiated and organized happenings with people such as Jean-Jacques Lebel, in addition to other events and exhibitions. She has lived and worked in the Netherlands and France since 1971, and was involved in the international activities of Galerie Brinkman in Amsterdam until 1989. When Stedelijk director Willem Sandberg appoints De Jong to the staff of the applied art department in 1958, a special bond with the museum springs up. Her admiration for the museum’s renowned collection grows and, being an artistic autodidact, this same collection functions as a school of learning for De Jong’s own work. During this period she studies art history at the University of Amsterdam with Hans Jaffé (adjunct director of the Stedelijk at the time), who has an influence on her intellectually. During this same time she also meets Asger Jorn and becomes acquainted with Guy Debord, leader of the S.I. Soon after, Debord and other members of the SI, such as Jorn and Constant, attempt to organize a radical exhibition in the form of a labyrinth at the Stedelijk, for which a portion of the exterior wall would be demolished and the public made to walk through the city while following instructions dictated via walkie-talkies. Hans and Alice de Jong, 1969. Photo: Eddy Posthuma de Boer. Sandberg pulls the plug on the project at the last minute and instead puts on a solo exhibition of the former Italian S.I. member Giuseppe (Pinot) Gallizio. Several Dutch members are kicked out of S.I. due to the construction of a church in Volendam: churches were not considered a merit to the revolution. Following this, Debord asks De Jong to head the Dutch section on her own. She departs for Paris half a year later, on the advice of Sandberg and Jorn, in order to practice etching in Stanley Hayter’s Atelier 17. 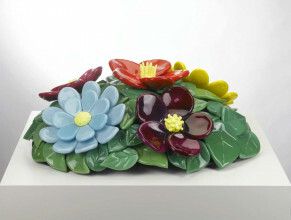 In Paris she evolves as an artist, sculptor, and graphic designer. 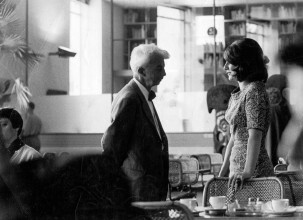 Willem Sandberg and Jacqueline de Jong in the restaurant of the Stedelijk Museum Amsterdam, 1958. Photo: Bob Alberts. 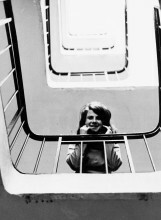 Jacqueline de Jong in the staircase of her studio at 97 rue de Charonne, Paris. Archive Jacqueline de Jong. In 1962, along with the Scandinavian section, De Jong is dismissed from the SI. 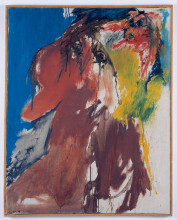 Jorn withdraws and goes “underground” under the name of Keller, although he remains involved for several years as a financier for Debord’s films, among other things. The removal comes as a result of their solidarity with Gruppe SPUR, which had previously been kicked out of the S.I. 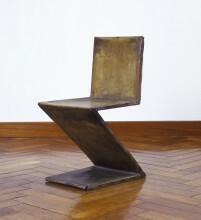 The conflict arose from a disagreement between Debord and members Raoul Vaneigem and Attila Kotányi, who no longer supported the production of art and the sale thereof. 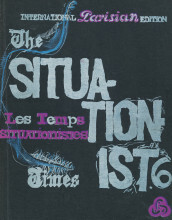 In May 1962 De Jong launches her earlier announced English-language magazine, The Situationist Times, together with pataphysician Noël Arnaud. When he withdraws after the second publication, De Jong is left fully responsible as editor and publisher, and independently releases four more issues. The archive of the magazine was purchased in 2012 by the Beinecke Rare Book & Manuscript Library at Yale University. “The Situationist Times” no. 1, May 1962. 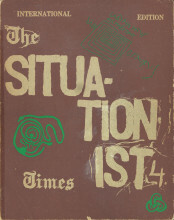 “The Situationist Times” no. 2, September 1962. 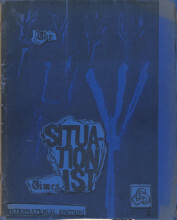 “The Situationist Times” no. 3, January 1963. 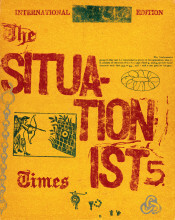 “The Situationist Times” no. 4, October 1963. 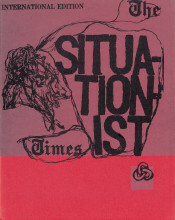 “The Situationist Times” no. 5, December 1964. “The Situationist Times” no. 6, December 1967. 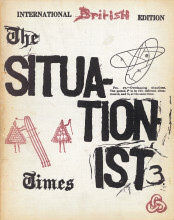 In contrast to Internationale Situationniste, the more theoretical and text-oriented journal by Debord and his associates, The Situationist Times is multidisciplinary, playful, full of photographs and drawings, and dedicated to various themes like the node, the ring, and the labyrinth. These “topologies” are an alternative form of knowledge: a non-Euclidean system that operates in the field of paradoxes, misunderstandings, and contradictions. For today’s spectator, the enormous “comparative” image databases, which De Jong sometimes spent months researching, are at the same time a fascinating harbinger of the internet. Although the final issue of The Situationist Times appears in 1967, from 1971 De Jong continues to work with Hans Brinkman on an edition about the topology of the pinball machine and the game. The result is a special archive with documentation about the worldwide popularity of pinball. A testament to this are the reviews and photos of the pinball world championship that took place in 1972 on Amsterdam’s Museumplein. This archive was rediscovered in 2016, and will be presented to the public for the first time in the context of this exhibition. 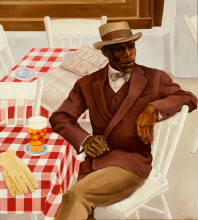 Parallel to this “artistic research,” De Jong develops a diverse oeuvre that effortlessly shifts between various visual languages: from expressionist painting to new figuration and pop. The scale also varies, from small diptychs and handwritten diaries to monumental canvases in which an absurd, often savage and sensual world reigns. 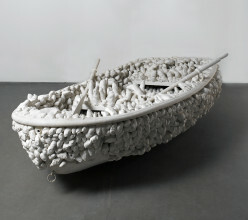 De Jong frequently works in series, and a constant factor in her oeuvre is the focus on the narrative, wherein themes range from violence and eroticism, to space travel and gastronomy, and from conversations with iconic figures from art history and literature, to the potatoes she cultivates in her garden in France. 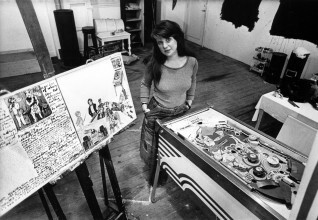 Jacqueline de Jong in her studio with pinball machine. Archive Jacqueline de Jong. Photo: Nico Koster/Maria Austria Instituut. Jacqueline de Jong, “Le vent s’envolle,” 1961. Collection Ambassade Hotel. Courtesy the artist. 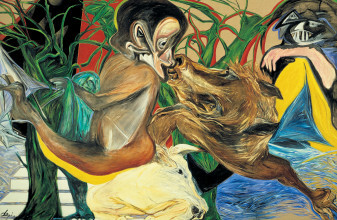 Jacqueline de Jong, “Ceux qui vont en bateau,” 1987. Collection of the artist. Courtesy Dürst Britt & Mayhew, The Hague (NL) / Château Shatto, Los Angeles (US). 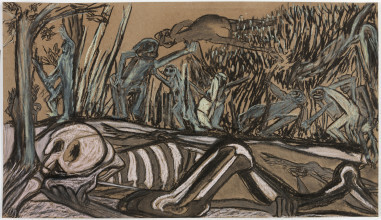 Jacqueline de Jong, “War 1914-1918,” 2013. Collection of the artist. Courtesy Dürst Britt & Mayhew, The Hague (NL) / Château Shatto, Los Angeles (US). Visitors will get a sense of the historical development of De Jong’s oeuvre in the exhibition’s thirteen galleries, as well as the more trans-historic fascinations and themes which recur in her work, time and again. 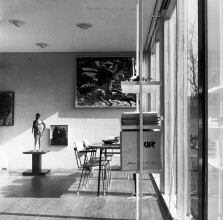 Each room contains an assortment of works by De Jong and other artworks from the Stedelijk collection. Previously unseen archival material from De Jong and the Stedelijk collection will also be on display. The exhibition is curated by Margriet Schavemaker (curator and Manager of Education, Interpretation and Publications at the Stedelijk Museum) in collaboration with Jacqueline de Jong. Margriet Schavemaker (Netherlands, 1971) is Manager of Education, Interpretation, and Publications at the Stedelijk Museum Amsterdam and Professor of Media and Art in Museum Practice at the University of Amsterdam (a chair in collaboration with the Stedelijk Museum). Schavemaker writes about contemporary art and theory and organizes discursive events, such as the acclaimed lecture series Right About Now: Art and Theory Since the 1990s (2006–2007), Now is the Time: Art and Theory in the 21st Century (2008–2009), and Facing Forward: Art and Theory from a Future Perspective (2011–2012). As curator she has organized various exhibitions, including The Stedelijk Museum & The Second World War (2015), ZERO: Let Us Explore the Stars (2015), Jean Tinguely: Machine Spectacle (2016), and the permanent collection presentation Stedelijk BASE (2017–2022, in collaboration with Beatrix Ruf, AMO/Rem Koolhaas, and Federico Martelli).